Pinterest, the social network that allows users to ‘pin’ content to their own bulletin boards, can be used in a variety of ways in education. Click here to see 25 of the best pinterest boards in education. Check out how in these two excellent resources. 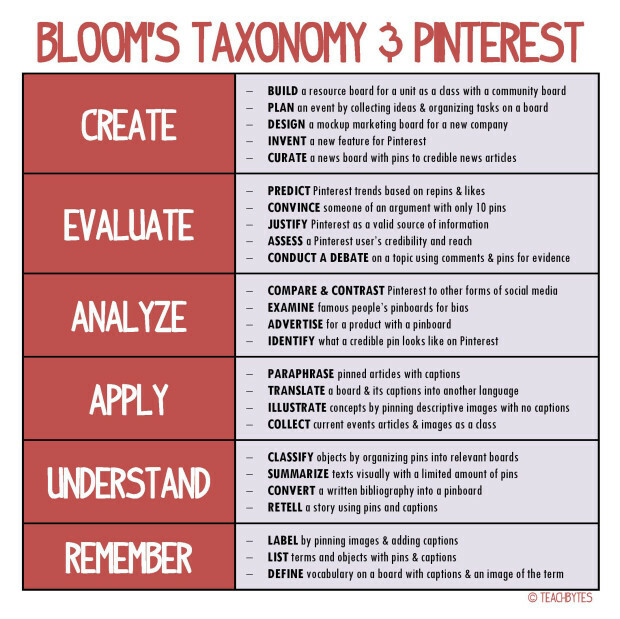 EDUTOPIA ” We’re big fans of both Pinterest and Bloom’s Taxonomy. So you can imagine our excitement when we saw this handy (and printable! Click here for the PDF) guide designed to inform you how to use Pinterest with Bloom’s Taxonomy. It showcases a couple dozen (25) ways to integrate Bloom’s with Pinning. From building a resource board to defining vocabulary on a board with captions and images, there’s a lot of work to be done thanks to this graphic. The folks at TeachBytes made this wonderful chart and deserve some virtual hand-clapping for coming up with such a clever idea. I’d recommend using this chart over the summer and build out some lesson plans while you have the printed-out chart (see above) on your desk. The printed version will keep you coming back for more and your students will thank you for it. If you like this post, check out our links page for some other great resources. Would like to see more of your fav pinterest boards…notice you source from them quite a bit. Any posts o pinterest coming? Yes, am starting to collate some favourite boards. But really, the Pinterest search engines are so good… a never ending idea-fest just by typing in a topic. Art teachers sure do love PInterest, and the creative boards are endless.